Newport, Oregon: On Monday, October 9th, Judge Sheryl Bachart heard from the parties in the lawsuit Rex Capri and Wakefield Farms, LLC vs. Dana W. Jenkins and Lincoln County, and intervenor-defendants Lincoln County Community Rights. The lawsuit was filed in response to the ban on aerial pesticide spraying imposed by the vote of the people on May 16, 2017. During yesterday’s hearing, and after delivering their arguments, the parties asked for a Summary Judgment from Judge Backart in a courtroom packed by attending public. Lincoln County Community Rights, Intervenor-defendants, held a rally at the intersection of Highway 101 and Highway 20. LCCR was supported by a crowd of over 30 people, who waved signs at passing vehicles calling out the issues that motivated Measure 21-177, among them the harm done by aerial pesticide spraying to people and ecosystems, the injustice of laws drafted by corporations for approval by our legislature which make it illegal for the people to protect their health and safety more stringently than the state’s regulations allow. This is known as State preemption. “Preemption laws are emblematic of the “top-down” hierarchical, authoritarian control preferred by corporations. Rather than have to contend with thousands of town and counties, the corporations need only seduce state and federal legislators who are always on the prowl for campaign cash,” said LCCR member John Colman-Pinning. LCCR members also called for better protection of our ecosystems and for recognition of the Rights of Nature. Honking horns saluted the sign waivers. Attorney for Plaintiffs, Gregory A. Chaimov, argued for full annulment of Measure 21-177, on the grounds that it is preempted by state legislation, which declares that pesticide regulation is the exclusive province of the state and are more powerful than the right of the people to make law that advances greater protections for health and safety. Lincoln County, represented by County Counsel Wayne Belmont, although defending only a small portion of the ban on aerial pesticide spraying as applying to county property and to land located within urban growth boundaries, did say that the people’s right to bring new law forward through the initiative process needs to be protected. In his argument, Wayne Belmont favored salvaging portions of Measure 21-177 and asked for advice from the judge in doing that. The judge can comment on the ordinance, but cannot add language to it or subtract language from it. Attorney for Intervenor-Defendants Lincoln County Community Rights, Ann Kneeland, raised the argument to the high moral ground where it belongs by bringing in the language of the Declaration of Independence (recognized as an organic law of the United States and part of the United States Code), and of Section 1, Article 1 of the Constitution of the State of Oregon. Both documents refer to the people’s inherent right to local community self-government in matters that pertain to their fundamental rights, listed in each. They also refer to the government power that is inherent to the people, and to their right to change that government when it fails to protect their fundamental rights. She also referred to the power to influence legislation which corporations have acquired through the Supreme Court ruling that “money is speech”, exposing where our government is failing us by allowing our legislatures to be influenced by the profit interests of corporations, although there is no law that states that they can do this. Judge Bachart did not issue a final ruling on the lawsuit questioning the legality of Measure 21-177 and will take the time she needs to review all arguments and reach her decision. That time may or may not come until the beginning of next year. To see all of the filed court documents please visit www.lincolncountycommunityrights.org/court-documents. 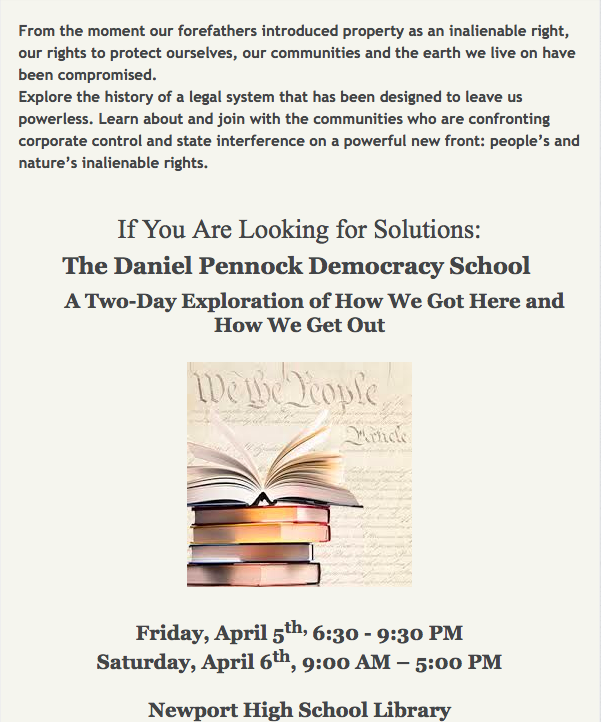 Newport, Oregon: On the morning of October 9th, Judge Sheryl Bachart will hear from parties in the lawsuit Rex Capri and Wakefield Farms, LLC vs. Dana W. Jenkins and Lincoln County, and intervenor-defendants Lincoln County Community Rights. The lawsuit was filed in response to the people’s affirmative vote to ban aerial spraying of pesticides in Lincoln County on May 16, 2017. The ballot measure, Measure 21-177, has been law in Lincoln County since early June, and no documented aerial spraying has occurred since then. In their original complaint and associated briefs, plaintiffs Rex Capri of Newport and Wakefield Farms LLC of Eddyville claim that the county’s ban on aerial spraying of pesticides is overridden by state preemption laws. If that claim is upheld, it would mean that the authority of corporations to engage in aerial pesticide spraying for profit is held to be superior to the right of the people of Lincoln County to ban such spraying due to its documented harms to public health and the environment. The most recent evidence of the toxic effect of pesticides came to light a month or so ago when it finally became possible to release an extensive collection of documents, now referred to as the Poison Papers (www.poisonpapers.org). The documents had been stored for several decades by Lincoln County resident Carol Van Strum, a key figure in getting the government to stop aerial pesticide spraying on federal forests in Lincoln County back in the 1980’s. The plaintiffs claim additionally that the measure should never have been voted on in the first place because the county lacked the authority to even pose the question of an aerial spray ban to the voters of Lincoln County. In defending the authority of Lincoln County voters to enact the ban, Lincoln County Community Rights (LCCR) will be asserting the people’s right of local community self-government. LCCR will argue that, based on their inherent and inalienable right to self-govern, the people of Lincoln County have lawfully enacted local rights to protect the health, safety, and welfare of the County’s residents and environment more stringently than the state is willing to protect them. The voters’ approval of Measure 21-177 also protects the community’s rights to clean air and water. Additionally, LCCR argues that, even under the state’s laws, the ordinance is lawful because local laws are presumed to be valid except where the law conflicts with preemptive statutes. LCCR maintains that the laws can be read to coexist where they seek to achieve different purposes. “This case gets to the heart of who and what our laws are meant to protect: the people or corporations? Community welfare or corporate profits? Lincoln County Community Rights is standing up to say that the law must recognize the right of the people, not corporations, to decide fundamental issues in the communities where they live.” says Ann Kneeland, attorney for LCCR. The hearing on the parties’ motions for summary judgment will be heard at 11:00 am on Monday, October 9th, in front of Judge Sheryl Bachart, in Courtroom 300 of the Lincoln County Courthouse in Newport. Hearing on September 11th to determine granting intervention to the Siletz River Ecosystem. Newport, Oregon: In the morning of September 11th, Judge Sheryl Backart will hear from proponents of the Siletz River Ecosystem why it should be granted admission into the lawsuit Rex Capri and Wakefield Farms LLC (Plaintiffs) v. Dana W. Jenkins and Lincoln County (Defendants), and Lincoln County Community Rights (Intervenor-Defendant). The lawsuit, filed in June by Rex Capri of Newport and Wakefield Farms LLC of Eddyville, claims that voter-approved Measure 21-177 cannot ban aerial spray of pesticides because plaintiffs have more legal rights to continue to spray aerial pesticides than the people do to ban the practice. Measure 21-177 has been law in Lincoln County since early June, as approved by voters on May 16, and since then no documented aerial spraying has occurred. Pesticides have been documented as being toxic and harmful to people and the environment for a long time. The most recent evidence of that, and of collusion of the EPA with the pesticide industry to falsify and hide that evidence, came to light when 20 tons of documents stored for close to 40 years in a dusty barn by Lincoln County resident Carol Van Strum, were finally scanned, digitized and made available to the public this last August through the efforts of Carol Van Strum and Peter Von Stackelsburg, her publisher, with the help of funding from The Center for Media and Democracy. Carol Van Strum was a key figure in getting the government to stop aerial pesticide spraying on federal forests in Lincoln County back in the 1980´s. The collection of documents stored in her barn has been made available to the public at – www.poisonpapers.org. Access to the complete and continually updated documents is available at http://thegemstonefile.org/the-documents.html. Right to be Free from Toxic Trespass. All people of Lincoln County, along with natural communities and ecosystems within the County, possess the right to be free of aerially sprayed pesticides. The intervention of the Siletz River Ecosystem marks the third ecosystem in the United States to take legal action to protect its rights. 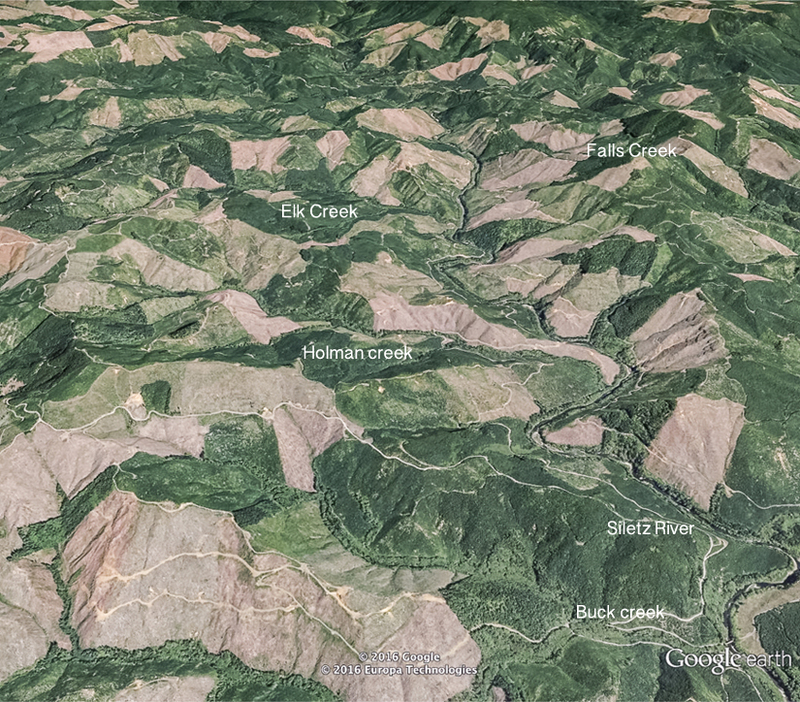 The Siletz River gorge landscape has changed drastically in the last ten years. The entire Siletz watershed has lost 46% of its forest in the last 16 years. Huge clear-cuts have all been aerially sprayed with pesticides multiple times. The steep terrain, barren of vegetation, leads to mudslides and pesticide run-off into the river and smaller feeder creeks. Steep slopes entail a major risk of contaminating the river and streams during the spray season. The Siletz River is an important source of drinking water for Lincoln County. This area is also a crucial salmon and steel-head habitat. Over the last year, high courts in New Zealand, India, and Colombia have recognized rights for rivers as a means of creating a higher standard of protection for those ecosystems. In Ecuador, the federal constitution has recognized the rights of nature since 2008, and has held in two different legal cases that rivers have rights which human activity has violated and that restitution goes to restoring the damaged ecosystems. The hearing on the motion to intervene will be heard at 11:00 a.m. on Monday, September 11th, 2017, in front of Judge Sheryl Backart, in room 300 of the Lincoln County Courthouse in Newport. A letter from Carol Van Strum. Fifty-six years ago, Dr. Seuss wrote the parable of the Lorax, who speaks for the trees, trying to save them from an insatiable factory that consumes every tree and poisons the river, air, and soil of a once-verdant forest. Neither the Lorax nor Justice Douglas were heeded, and countless ecosystems have since been lost, dooming innumerable species into extinction. Today an inanimate object called Wakefield Farms Company is plaintiff in a lawsuit challenging a voter-approved ordinance banning aerial pesticide spraying in Lincoln County, which specifically provides standing for natural objects threatened by aerially-applied poisons. On Monday, September 11, the court will decide whether the Siletz River Ecosystem has the same right as a profiteering company to argue for its own preservation. Lincoln County, with a proud history of landmark environmental victories, has a chance to score another by finally upholding Justice Douglas’s unheeded plea. For Siletz River Ecosystem in Rex Capri, Wakefield Farms LLC v. Dana W. Jenkins, Lincoln County. Measure 21-177 increases its lead to 61 votes, winning a highly contested election. Newport, Oregon – A majority of voters who returned to sign unsigned ballots approved Measure 21-177, bringing the total vote to 6994 for the ban versus 6933 against it, making the ban on aerial pesticide spraying in Lincoln County a reality. Thanks to the many people who volunteered and campaigned so valiantly, the vast amounts spent by corporate opponents failed to convince voters that profits are more important than health, safety, and the right to informed consent. This election was the first major hurdle Measure 21-177 had to overcome to become a reality. Implementation of the measure, and the obstacles to it that opponents will raise, among them superior “rights” to override the rights of the people, including the people’s right to vote and their constitutional right to safety, are next. Citizens for a Healthy County will continue to meet those challenges, and welcomes all who are willing to join us in the effort. Newport, Oregon: This afternoon the Siletz River Ecosystem filed a motion to intervene in the lawsuit Rex Capri and Wakefield Farms, LLC v. Dana W. Jenkins and Lincoln County, and Lincoln County Community Rights. This is the third ecosystem in the United States to take legal action to protect its rights, secured in this case by Measure 21-177, which was adopted by Lincoln County voters in the May 2017 election. The two plaintiffs – Rex Capri of Newport and Wakefield Farms of Eddyville – claim that their “right” to spray toxic pesticides aerially is greater than the right of the people of Lincoln County to protect public health, clean water, and the rights of ecosystems and natural communities not to be poisoned from the air. Lincoln County Community Rights (LCCR) was granted intervention in the case on July 2, 2017, after the county made it clear that their interest lies merely in getting an opinion from the court and not in actively defending the law adopted by voters in May. 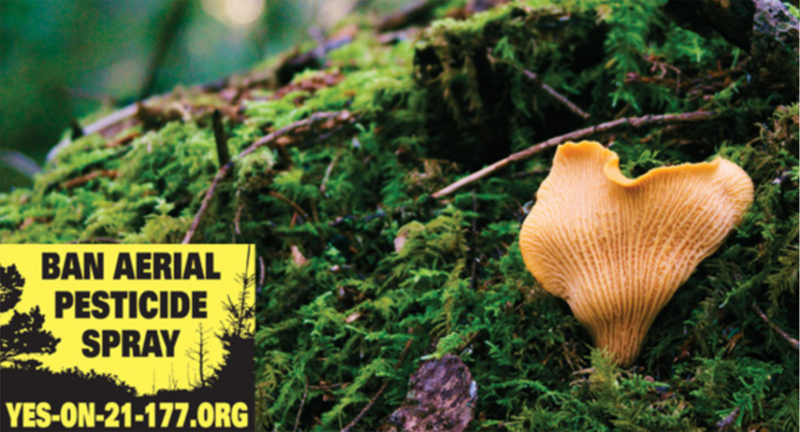 For the first time, the Siletz ecosystem and all Lincoln County natural communities and ecosystems have secured the right to be free from toxic trespass from aerially sprayed pesticides, a right that is essential to ecosystems’ on-going health, function and survival. That right is stated in Section 2(a) of Measure 21-177 or the Freedom from Aerially Sprayed Pesticides Ordinance of Lincoln County. The Siletz watershed has lost 46% of its forest in the last 16 years. 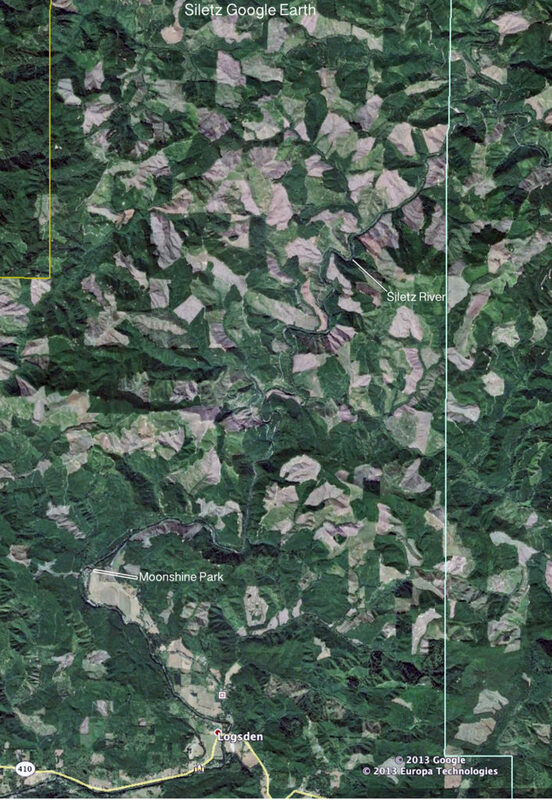 Huge clear-cuts resulting from strip logging abound in the area and have all been aerially sprayed with pesticides multiple times. Barren of vegetation, the steep terrain causes mudslides and pesticide run-off into the river and smaller feeder creeks, posing a high risk of contaminating a major source of drinking water for Lincoln County, and additionally destroying crucial habitat for salmon and steelhead. Over the last year, high courts in New Zealand, India, and Colombia have recognized rights for rivers as a means of creating a higher standard of protection for those ecosystems. In Ecuador, the federal constitution has recognized rights of nature since 2008, and two different legal cases have affirmed that rivers have rights and that human activity violates those rights. Restitution penalties go to restoring the ecosystem. Though the lawsuit continues to move forward, there is no indication as to how soon the court will respond to the motion to intervene by the Siletz River Ecosystem. 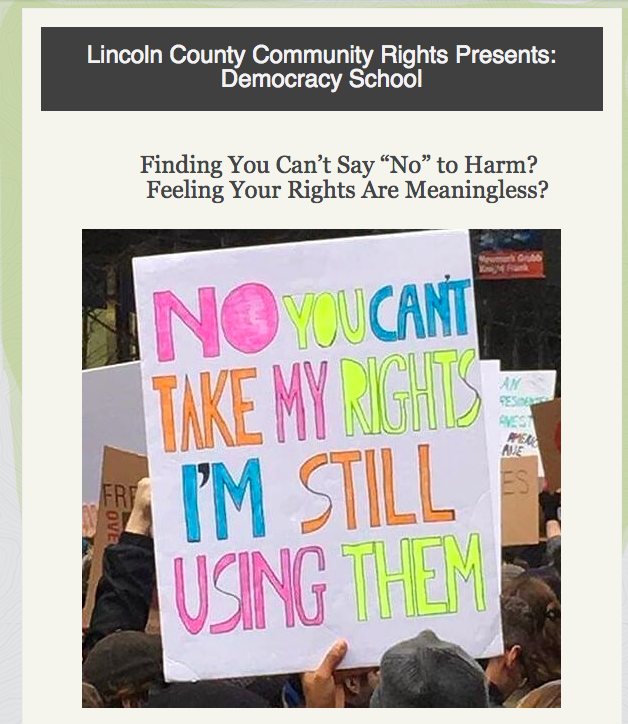 Lincoln County Community Rights is a public benefit organization that seeks to educate and empower people to exercise their right of local community self-government in matters that pertain to their fundamental rights, their natural environment, their quality of life, their health and their safety. Given the harms that people and ecosystems suffer from the practice of aerial spraying of industrial forest land with pesticides, the group drafted an ordinance to ban aerial pesticide spraying in Lincoln County, Oregon. Measure 21-177 was adopted by voters in May 2017, making Lincoln County the first county in the United States to ban aerial pesticide spraying through the vote of the people. This google earth photo is from the view point looking at the Siletz gorge from the South. Newport – Lincoln County Community Rights (LCCR) has filed to intervene in a lawsuit seeking to overturn Measure 21-177. The lawsuit was filed by Newport resident Rex Capri and Wakefield Farms, LLC against Lincoln County and Dana Jenkins, in his capacity as County Clerk. Measure 21-177 was voted into law by the people of Lincoln County in the May 16, 2017 election. Intervention allows Lincoln County Community Rights (LCCR) to join the County as respondents in the suit, allowing the people of Lincoln County to stand up for the peoples’ law. The County has made it known that its interest in the lawsuit is to see what the court decides. Such an approach falls short of actually defending the ordinance approved by the people’s vote. In this lawsuit, LCCR is represented by CELDF attorney Ann Kneeland. 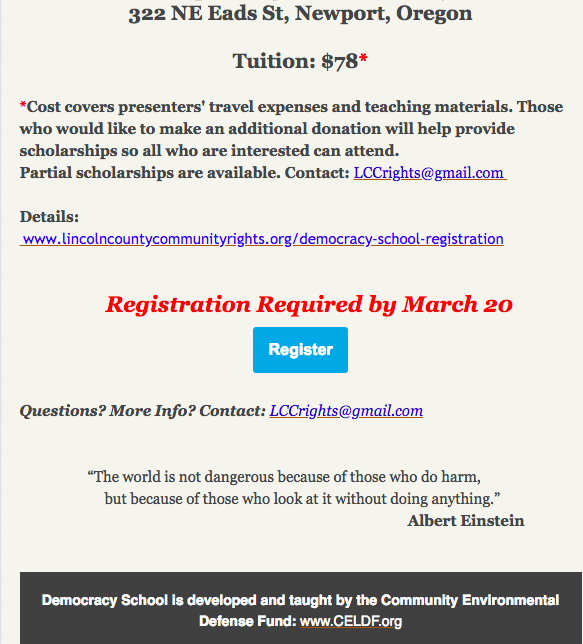 Lincoln County Community Rights (LCCR) is a non-profit group based in Lincoln County and run by local volunteers that seeks to empower people to exercise their right to local community self-governance in matters that pertain to their fundamental rights, their natural environment, quality of life, health and safety. Measure 21-177 campaign was run by Citizens for a Healthy County (CHC), political committee of Lincoln County Community Rights. The right of local community self-governance gives Lincoln County voters the right to create and pass local laws that protect the health, safety and welfare of the people, their community, and nature. It also empowers them to enact laws that ban corporations from engaging in activities that violate the above rights and obligates County government for enforcement. Measure 21-177, which is also known as the Freedom from Aerially Sprayed Pesticides Ordinance of Lincoln County, secures the rights of people to be free from toxic trespass, the right to clean air, water, and soil, and the right to enjoy outdoor recreation all free from the harm of aerial sprayed pesticides. In addition, the rights of ecosystems and natural communities in Lincoln County are also protected from aerial spray of pesticides. It is common in Lincoln County and in other communities in Oregon for the timber industry to administer multiple aerial sprayings in conjunction with the practice of clearcutting and replanting within the industrial forest model. Contrary to the plaintiffs’ assertions filed in their complaint, LCCR believes that the Freedom from Aerially Sprayed Pesticides Ordinance of Lincoln County has been lawfully and validly adopted by the authority of Lincoln County’s voters. LCCR asserts that this law should be enacted and enforced under the constitutional right of local self-government which takes precedence over state preemption when laws enacted by the latter are less protective of health and safety. As part of the continuing education around local community self-government, the defense and enforcement of Measure 21-177, and what is involved in the current lawsuit, , LCCR is holding a public Community Rights Action (CRA) meeting every fourth Thursday of the month at the Visual Art Center (unless posted to take place at a different location), from 6:30 to 8:30. These meetings will sometimes include guest speakers and films.